Artist Kasabian Beck asks us to consider celebrity within Second Life in his latest exhibition at Hotel Dare, “Slebrity™”. 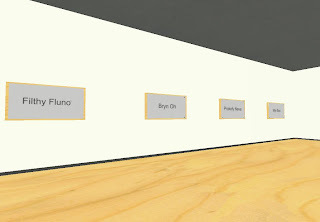 Presented against the spare white walls of the gallery are several panels depicting the names (in an also spare, sans serif font) of well-known personalities – creators of all types - within SL, seen in the image above. Struck by the cult of personality in the metaverse, Beck muses on “the very idea of virtual notoriety, how it is sought, attained and why it is or is not important...” I wasn’t familiar with all the names presented in the gallery which is an important point. It’s possible I might not have known any of the names – what meaning would the exhibition have had for me then? The names chosen have been curated – by the artist – revealing his own particular world experience. This exhibition will mean something different to each viewer and ought to inspire discussions about what I call the “flux” of personality. What most of the names have in common is that they are brilliant self-promoters. In art, reputation can be considered more valuable than in many other fields where celebrity is cultivated. Look at the Young British Art movement of the mid ‘90s; young artists, with small bodies of work behind them, created retrospectives and museums dedicated to themselves, to protest the English art institutions that had belittled them. Is the tone of this exhibition condescending? Do these names have any value at all as ideas or things to disagree with? Virtual fame is the same as any other kind of fame, earned and unearned. As psychologist James Houran writes, “we need celebrities as much as we need food, water and shelter. We need them to feel connected.” These names on the wall are humans, not martians, not simply avatars. We condescend to these human fundamentals, our desire for celebrity, at our peril because we are human – not always wonderful but very predictable and found in all environments. A thought-provoking exhibition...go to Slebrity and have a think.